Fourteen years after “Barbershop," Calvin (Ice Cube) and his motley crew of hair-cutters are still shaping up the kitchens of their South Side Chicago clientele. The third installment of the series, subtitled “The Next Cut," drops most of the original cast into a timely story about gang violence and the power of a neighborhood bonding together. As Eddie (Cedric the Entertainer), the shop’s raucous provocateur said in the first film, the barbershop is a place for people to feel safe expressing their thoughts and ideas. Writers Kenya Barris (“black-ish”) and Tracy Oliver extend this notion, turning Calvin’s into a gang-neutral safe zone in response to a political measure designed to wall in the neighborhood. That measure is in response to rising statistics of violence, and is being championed by former employee, Jimmy (Sean Patrick Thomas). Jimmy has traded in his clippers for politics, a perfect match for the holier-than-thou persona we remember from the first film. Just like everything else that gets mentioned in the barbershop, Jimmy’s idea is met with intense discussion, pro and con. Eventually, someone suggests using Calvin’s as a safe zone for a 48-hour truce between rival neighborhood factions. During the truce, haircuts will be free for anyone. Barber Jerrod (Lamorne Morris) sets up a social media hashtag, and the main story of “Barbershop: The Next Cut” is set in motion. Like its predecessors, this is an ensemble piece. Central to the story is Calvin’s son, Jalen (Michael Rainey, Jr.), a teenager chafing under the rigid rules of his parents. He and his pal, Kenny (Diallo Thompson) feel the deceptively alluring pull of joining the local gang, and much of the film’s suspense hinges on whether the duo will succumb to temptation. Calvin and his wife, Jennifer (Jazsmin Lewis) sense Jalen’s potential seduction into violence, and believe, as many parents do, that he is being led by his friend rather than being followed. This creates some well-acted scenes of tension between Calvin and Kenny’s dad, Rashad (Common). Rashad is married to my favorite holdover characters from the original, Terri (Eve). He’s taken over her chair while she hobnobs with celebrities in her high-profile job. Still yelling about her apple juice and swinging enough attitude to host “VH1 Divas” solo, Terri’s appearance ushers in the rowdy, no-holds-barred spirit that permeates the scenes inside the shop. Debate topics fly, and the most politically incorrect responses continue to rain from the mouth of Eddie, the shop’s elder statesman. You may remember the huge controversy over Eddie’s hilariously inappropriate comments about Dr. Martin Luther King, Jr. and Rosa Parks in “Barbershop," and that was before Twitter existed. Who knows what fresh Hell Eddie’s current, equally hilarious and inappropriate comments will unleash now that social media abounds? While its first sequel let viewers journey back into the history of the shop, “Barbershop: The Next Cut” offers a vision of the future. The original all-male client sanctuary has given way to a unisex place of business. The female banter of the beauty salon has merged with the macho bluster of the barbershop; now both parties get to hear the complaints that normally went unsaid when they were together. This dynamic gives the back-and-forth comedy an extra dimension of humor and insight, playing to the strengths of director Malcolm D. Lee. What fascinates me about Lee’s work, even in his less successful efforts, is his focus on the examination and deconstruction of the societal structures of African-American masculinity. In films like the superior “The Best Man” and its sequel “The Best Man Holiday," Lee bends his characters’ perceptions of themselves at odd angles, exposing the internal and external challenges placed upon them. Sometimes he nods in solidarity with them, and other times he calls them on their b.s. with a heaping dose of tough love that’s often issued by his female characters. His ability to funnel these explorations through a mixture of comedy and drama is his strongest directorial quality. 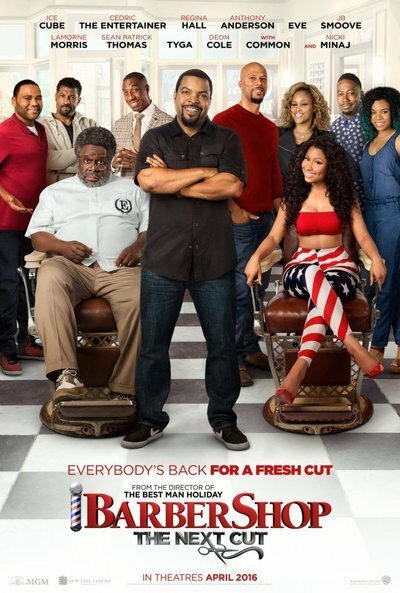 It helps “Barbershop: The Next Cut” sail smoothly through its few unsuccessful moments. The original cast is supplemented by several newcomers, most of whom come from the Kenya Barris-Malcolm D. Lee stable of actors. Regina Hall is great as Calvin’s partner, Angie, and she’s given a nice serious scene to compliment her expected comic mastery. Common brings a sense of grace under pressure to his scenes with Eve and especially Ice Cube. Cube remains a great straight man, charitably letting the comedians bounce off his stoicism. He also gives some of his best dramatic scenes since his heartbreaking turn in “Boyz N the Hood." Conversely, I wish more had been done with Nicki Minaj’s character. She’s fine in the role, but it’s written in such one-note fashion that she never feels as real as everyone else. “Barbershop: The Next Cut” belongs, as the entire series does, to Cedric the Entertainer. His Eddie is the quintessential definition of a supporting character, and back in “Barbershop," his performance was Oscar-worthy. Convincingly playing much older than he actually is, Cedric the Entertainer infuses his character with the perfect timing of a comedian and the generosity of someone who wants to pass on life lessons to his younger colleagues. There’s a mischievous twinkle in his eyes whenever he says something horrible, but if you look closely, you’ll also see genuine concern in them when he’s not joking. In every film, there’s a scene where Eddie talks seriously about a situation, and those scenes are some the best ones in the series. As for his comedic moments, the coda in this film may be his finest one. For all its humor—and the film is quite often laugh-out-loud funny—“Barbershop: The Next Cut” never loses sight of the gravity of its primary situation. Calvin’s fear for his son’s well-being is a palpable one that any parent, regardless of race, can identify with. The threat of violence is never treated in comedic fashion (a scene between the heads of rival gangs inside Calvin’s is as tense and terrifying as any drama you’ll see). And even when the film threatens to get downright preachy and a bit too on-the-nose, it never loses its pull on the viewer. Sometimes we need a good sermon, and like the best of sermons, “Barbershop: The Next Cut” dispenses its message with enough humor and wisdom to inspire and linger after it’s done.